Crushed aggregates from the former foundations of White Hart Lane are being used to form dazzling new floors at Tottenham Hotspur’s new stadium. Initial dull grey concrete mixtures for the concourse flooring did not achieve the look the club was after. Crushed aggregate was mixed in to the new concrete to create a shiny bronze finish. And the material was sourced from the club’s former White Hart Lane home to provide a solid link with the past at the new ground being built by Mace. 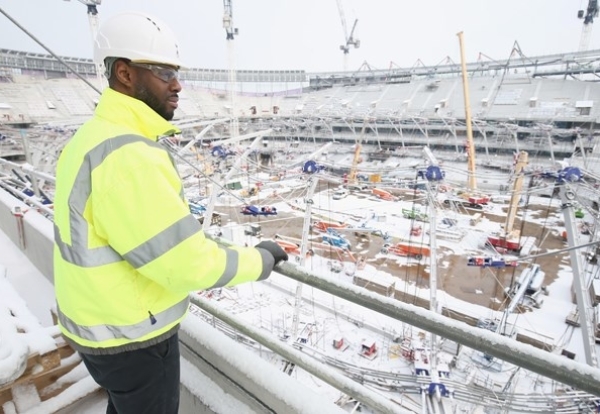 Former captain Ledley King walked the new concourses for the first time. He said: “The Lane was home to me and so many others for most of my life – so what I am doing is effectively walking on memories. “It’s amazing to think how taking aggregate from the foundations of that special place can create something so beautiful and fitting that we see today – just looking at it makes me a bit emotional.